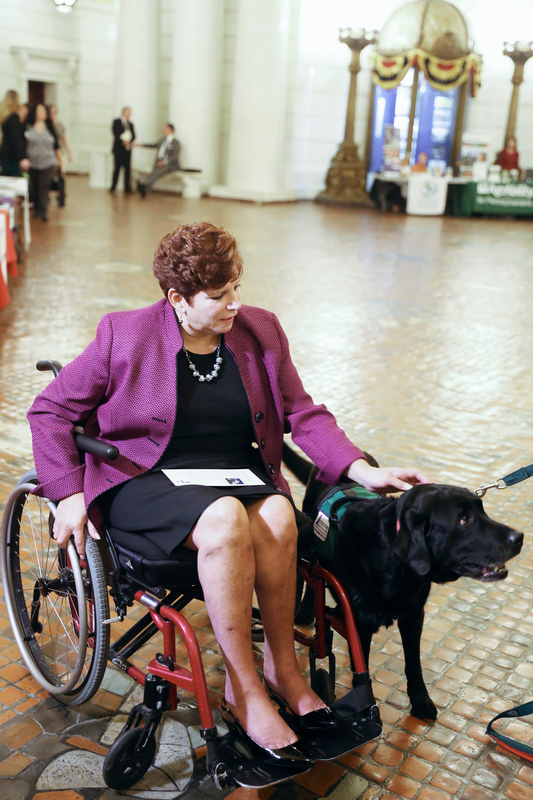 HARRISBURG, PA, October 20, 2017– Pennsylvania Sen. Christine M. Tartaglione will welcome the community to the historic State Capitol Rotunda on Monday, Oct. 23, to learn about a multitude of resources available to persons with disabilities. Senator Tartaglione’s annual Disability Employment Awareness Day will be held from 10 a.m. to 4 p.m. and feature dozens of organizations that offer a wide array of products and services ranging from accessibility tools and service dogs to simulation devices that will allow visitors to experience briefly the daily challenges faced by people with physical disabilities. News media coverage is invited and encouraged. Disability Employment Awareness Day coincides with National Disability Employment Awareness Month throughout October. Senator Tartaglione was the primary sponsor of a resolution adopted by the Senate recognizing the month-long national effort to raise awareness about disability employment issues and honor the many contributions of workers with disabilities. The observance further promotes positive employment outcomes for people with disabilities and endeavors to expand ideas about what youths with disabilities can achieve when they receive encouragement and support for their ambitions. Senator Tartaglione has long been a leading advocate for people with disabilities and knows first-hand of the challenges that confront them every day. She has been overcoming many of the same challenges since she sustained severe spinal injuries in a 2003 boating accident. Among the many presenters scheduled to participate in Disability Employment Awareness Day are the Pennsylvania Office for the Deaf and Hard of Hearing, Susquehanna Service Dogs, Temple Accessibility Devices, the Center for Independent Living of Central PA, Unique Source Products & Services, the Bureau of Blindness and Visual Services, Pennsylvania Assistive Technology Foundation, AgrAbility, the Pennsylvania Initiative on Assistive Technology and Einstein Healthcare Network. Senator Tartaglione represents the 2nd Senatorial District which serves the Philadelphia neighborhoods of Kensington, Juniata Park, Frankford, Northwood, Oxford Circle, Lawncrest, Wissinoming, Tacony, Mayfair, Holmesburg, Burholme and Fox Chase. The Pennsylvania State Capitol is at 501 N. Third St., Harrisburg. It was completed in 1902, is listed on the National Register of Historic Places and is designated as a National Historic Landmark. For tour information, visit http://www.pacapitol.com/plan-a-visit/tours.cfm.